After a deal goes south, Keanu Reeves and Jimmy Kimmel find themselves engaged in a seriously intense car chase. With high stakes, the two really pump into gear, but instead of hitting pedal to the medal, just a light tap, and keeping track of the traffic and area surroundings. The first ever film produced by the California Highway patrol offers up a rule-following car chase that the Consumer Safety Council says "will leave you in the middle of your seat...where you won’t fall off." The whole parody is pretty ridiculous, but is a fun trend that has been happening on late night talk shows as of late. Jimmy Kimmel gets into full character, rocking the unibrow and asymmetrical haircut while Reeves gets into his own comedic groove particularly by the end of the trailer when he gets to exclaim his safety message, "never talk and drive". 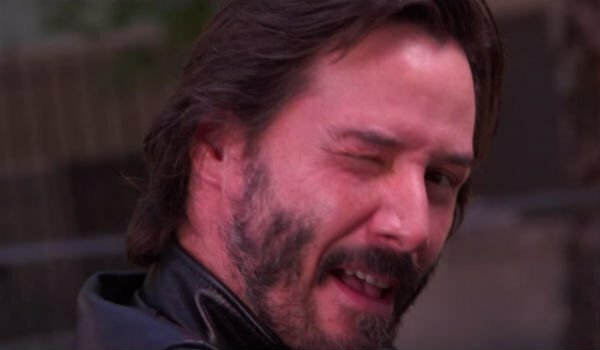 Along with one of the best winks you'll ever see. An obvious nod to the Fast & Furious franchise with the sleek sports cars, this high-stakes car chase spreads the message, there’s not necessarily a need for speed. And though Reeves has spent his own time manning a speedy vehicle, A Reasonable Speed won’t need risky car (or bus) maneuvers to keep its action going. Just think-- a speed bump actually has the power to change a car chase. Who knew?! Keanu Reeves is currently out promoting a different type of thriller these days, his new horror film Knock Knock, co-written and directed by Eli Roth. The film follows a devoted husband and father (Reeves) who is left home alone for the weekend when two gorgeous young women (Lorenza Izzo and Ana de Armas) show up at his doorstep for help. Things take a dangerous turn as what started as Reeves kindly opening his door to strangers, turns into a deadly game of cat and mouse. Knock Knock has been receiving mixed reviews from critics, but we’ll see how it takes in the box office when it releases tomorrow, October 9.